In response to their client’s insatiable appetite for speed, the people at Sector 9 created the Sector 9 Faultline. This drop platform board has been designed specifically to allow downhill riders to maximize the speed and the rush they receive on this board. The drop platform board allows the rider to make sure that their feet are locked in place, while at the same time guaranteeing that there is sufficient room for their speed truck. Don’t worry about calculating the equations that go into the aerodynamics of attaining maximum speed while bombing down that long hill. The professionals at Sector 9 understand the important role that aerodynamics plays in attaining maximum speed, and the Faultline is tailor-made to help you go as fast as gravity and the laws of physics will allow. This board has been designed to allow the rider to get into the perfect position that will allow them to accelerate to maximum speeds with minimum wind resistance. The Faultline is not only an amazing downhill board, but it has been designed to be the perfect all-around freeride longboard. It is guaranteed to shred up whatever piece of asphalt you dare put it on. Part of its amazing design includes its symmetrical platform. It has kick tails on either end. The board itself is extremely durable. You can kick it around, flip it around and force it to yield to your will, and it will still give you one of the best rides you have ever had. The board has been designed with unique concave flares that go along the midsection of the board. These flares keep the board rigid and provide nice pockets where the rider can keep their feet planted. At 28 inches, the wheelbase provides the perfect mix of stability and versatility to allow the rider to easily do a 360 degrees spin as they are cruising down one of the hills in their neighborhood. It provides enough stability to make the rider confident that the board will hold up under high speeds. 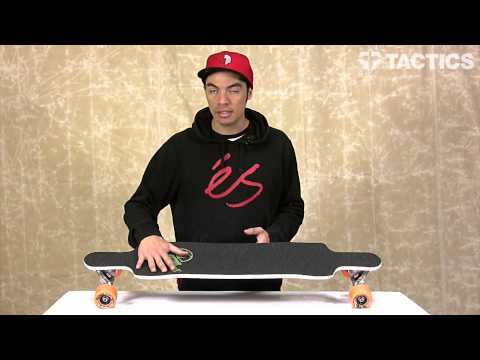 And while we are talking about stability, how about the 9 ply Maple constructed deck? This is going to stop the board from flexing. You will feel extremely secure and safe as you crouch or stand up on this board. Finally, when compared to other boards of this type, the Sector 9 Faultline is ridiculously cheap. As you are riding it, you will probably ask yourself, how in the world did I get such an awesome board at such an inexpensive price?